Music and the Cosmic. 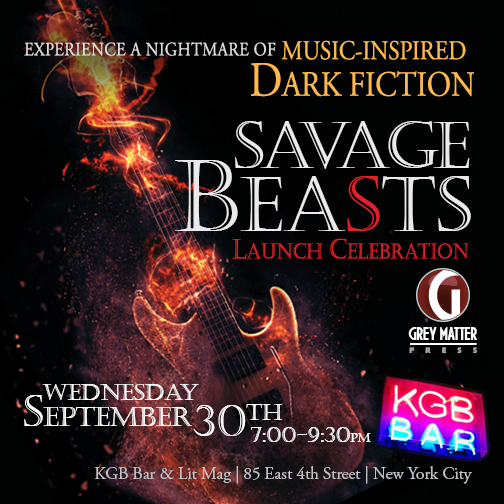 A night of music themed dark fiction at KGB Bar in celebration of the Savage Beasts Anthology. Savage Beasts is a music themed anthology that just launched from Grey Matter Press by Bram Stoker Award nominated editors Anthony Rivera and Sharon Lawson. Daniel Braum’s short story An American Ghost in Zurich appears in the anthology. In celebration of the book launch authors James Chambers and Nicholas Kaufmann who share a passion for music and dark fiction with Braum agreed to create this night of music themed readings in the spirit of the anthology to help him launch the book. Copies of Savage Beasts will be available. Website for KGB bar is here: http://www.kgbbar.com/ Look for the small neon sign outside that says KGB. Go up an outdoor set of stairs and then up the indoor stairs to the second floor. A small door is to your right. It opens up sometimes between 630 pm and 7 pm at any given night. If it is closed when you arrive just hang out the door will open soon enough. And Daniel Braum will most likely be there waiting with you. Admission is free! Hope to see you there !